Pottery and potatoes! – Pottery, paintings, photography, and more! 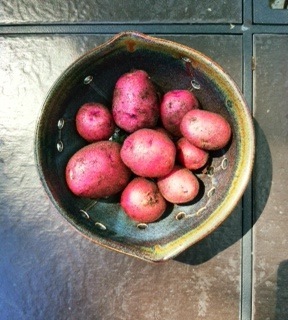 One potato, two potato, three potato, nine…today I harvested the first of the red potatoes and they are beautiful! My problem with fresh produce is that I often would rather create with it than eat it. Hopefully, I will be able to satisfy my need to create with a few pictures and then relent to scrubbing these up and serving them with a little salmon and a salad perhaps!